Do you think Putin or Obama will weigh in on the Brangelina divorce? That would make all the difference in the world in how their admirers cope with it. Aung San Suu Kyi who is administering the genocide of the Rohingya Muslim people for the Myanmar military, was given the 2016 Harvard Humanitarian of the Year award on September 17th. Both honorifics have now demonstrated their utter worthlessness & she more than deserves both of them. They will comfort her in jail if she is ever brought to justice. 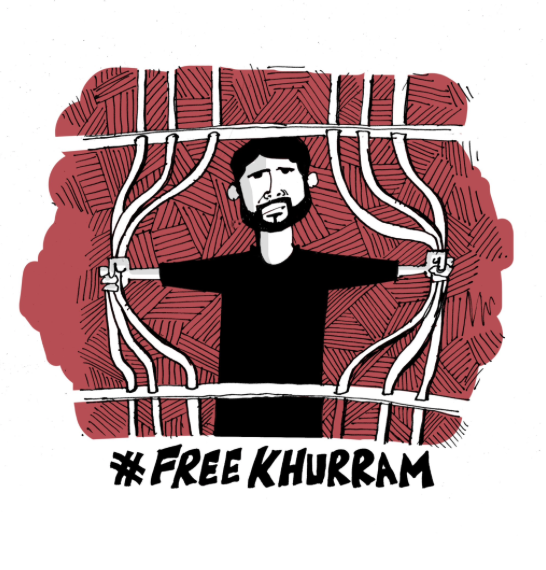 Khurram Parvez is still in police custody despite the court order to release him. He has been moved from the Kupwara police station to the Kothi Bagh police station in Srinagar & has still has not been informed of the charges against him or why he remains in custody. Muneeba Rubi Nawaz has just been locked out of FB for posting a photo of the Kashmiri man whose funeral was attended by 600,000 people but whose name cannot be mentioned on FB lest it incite terrorism. Huma Dar & others are still locked out for the same infraction of censorship. Let us be clear then that we denounce terrorism especially when its armed with pellet guns, tear gas, sound grenades, & live ammunition against unarmed protesters. This petition for their reinstatement is still moving slow as molasses. Only 1,600 names have been gathered by many people when I alone have nearly 14,000 friends. Don’t be a bump on a log & sign the damn thing. The two-part series on the 1996 murder of 6-year-old JonBenet Ramsey was actually quite valuable for resolving questions about that unsolved crime. They gathered top forensic specialists in several fields to reconsider evidence, interviewed detectives, FBI agents, the 911 operator, et al, who were involved in the case, showed video of the crime scene. They constructed a compelling case that Burke, her 10-year-old brother, accidentally struck & killed the child with a flashlight in a fit of anger. The parents staged an intruder murder to protect their son from prosecution which explains why they refused to cooperate with the investigation. It always seemed the police had bungled the investigation because the parents were obviously involved in some way. But according to this investigation, the police more than did their job & it was the district attorney who intentionally shielded the Ramsey parents from prosecution for covering up a crime. As a child of 10, Burke would not have been prosecuted for manslaughter. All those interviewed said the district attorney did so because of the immense wealth of the family. Dr. Bronner’s manufacturers just resigned from the Organic Trade Association (OTA), citing the association’s betrayal of GMO labeling & drift away from the principles of the organic movement. Good for them. Now if Dr. Bronner’s can just be persuaded to sever business ties with apartheid Israel. The labels on Dr. Bronner’s products are covered with new age spiritual slogans about world peace but their political savvy is nothing to sniff at. In 2007, a few years after BDS was launched by Palestinians, the company announced they were sourcing 90% of their olive oil (150 metric tons per year) from Palestinian producers in the West Bank through the trading firm Canaan Fair Trade (CFT) working with the Palestine Fair Trade Association (PFTA)–both organizations founded by an American-Palestinian entrepreneur. The Strauss firm is hardly a family farm. It is Israel’s foremost food & beverage company which in 2004 the Israeli Antitrust Authority labeled a monopoly–an enterprise engaged in all sorts of felonies. The Strauss family has deep connections to the Israeli military (IDF). From 1975 till 2001, the company was run by Michael Strauss, a former elite IDF scout. It’s now run by his daughter, Ofra, who posted not just support for but “adoption” of the Golani & Givati Brigades of the IDF on the Strauss website. The Golani & Givati Brigades are elite units of the Israeli military in operation since the 1948 war to dispossess Palestinians. Both have been involved repeatedly in Israeli wars against Palestinians, including every murderous siege on Gaza. Dr. Bronner’s can’t have it both ways. You can’t be all New Age on your labels & continue doing business with those involved in ethnic cleansing. It isn’t splitting hairs to say Dr. Bronner’s should be boycotted until they get rid of that 10% from Israel & sever business & political relations with Strauss. That 90%-10% split between sources for olive oil may well not be reliable–any more than their designation of Strauss as a family farm. Some may say, well that’s a lot of business for olive producers in the West Bank to lose if Dr. Bronner’s dumps them as a supplier. The first response is “what is the price we place on human lives in Gaza?” Less than 150 metric tons of olive oil? 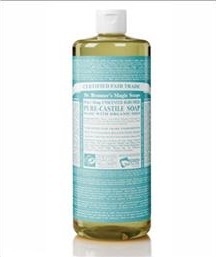 And the second response is, trust in the power of BDS to bring Dr. Bronner’s to its business senses. Boycott Dr. Bronner’s. Build BDS. 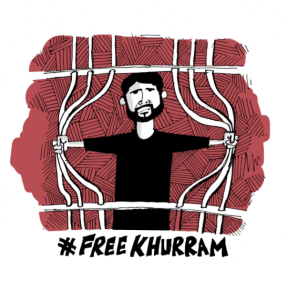 The Jammu Kashmir Coalition of Civil Society (JKCCS) reports that Khurram Parvez was ordered by a judge to be released from Kupwara prison. In violation of that court order, the police are holding him at the police station against his will & for no reason. Until he is returned home, his defense continues. In an era when wars, bombing, & military occupations dominate world politics, there is nothing more imperative than to rebuild the international antiwar movement. That makes the dysfunction & fragmentation of that movement all the more tragic as a result of discordant views of the Syrian War. It’s not unlike the discordance over WWI & WWII, both competitions over the division of colonial conquests but promoted as epic wars for democracy. It is not exaggeration to claim that most wars today continue the unfinished business of both those monstrous wars to reverse the successful anti-colonial struggles against US & European armies & maintain the colonial projects (like Israel). The divisions in the antiwar movement over Syria are emerging as a watershed moment in politics. If antiwar forces can’t agree on what’s happening, it’s not possible to chart a united course of action. Theoretically, the divisions represent the triumph of libertarian theoretical methods, of conspiracy-mongering, of inventing realities & denying or ignoring what doesn’t fit. The primary disputed questions are: is Assad a brutal dictator or a champion of the Syrian people? Is the US involved in a regime-change operation or are its motives for involvement more complex–not humanitarian, but more complex? Was there a 2011 popular uprising against Assad’s dictatorship or was that orchestrated by the CIA & Mossad, as libertarians claimed of all other Arab uprisings? 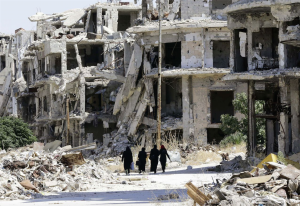 None of those who support the Syrian government ever deal straightforwardly with Syrian & Russian bombing of civilians, including with the use of chemical weapons & barrel bombs. That’s because they consider Syrian & Russian bombers emancipatory against US-backed terrorists & “jihadists.” The US & other regimes are training, arming, bankrolling some of those militias but that is not the entire story. Some of those militias oppose the dictatorship of Assad. The US & other regimes are there to defeat the democratic forces & confuse the issue. The US has always been able to tolerate dictatorship but it cannot allow popular revolutions against them. It postpones the eventual removal of Assad to destroy the democratic movement in league with Russia & Assad. Many prominent political analysts (like Tariq Ali & John Pilger) do not oppose Assad nor Russia. Infallibility in politics is not a concept any serious activist should respect. Every one’s views must be evaluated carefully. A US antiwar delegation met with Assad in Damascus & are now on tour peddling their politics as representing the US antiwar movement when they represent only a handful of activists. There has been no authoritative national antiwar conference in the US for years where these issues can be debated out. Most of those supporting Assad against an alleged US regime-change operation rely on reporting from the most questionable sources–sources who claim the White Helmets first responders who are digging people out of cement rubble are CIA operatives; that claim the images of little Omran were a deception put out by jihadists; that do hero worship of Assad rivaling the cult of Stalin; that glorify Putin without any regard for his political policies at home or war crimes in Syria & call any criticism of him demonizing. The Black Agenda Report (BAR), which is an invaluable source of analysis on many issues, just published an article by editor & senior columnist Margaret Kimberley where she said about Syrian use of barrel bombs: “The so-called barrel bomb doesn’t kill more people than conventional weapons provided by the United States & its puppets.” She echoes the article by former UK diplomat Craig Murray who said he would rather be bombed by a barrel bomb than other weapons. A simple internet investigation of barrel bombs will show their barbaric character & versatile, indiscriminate lethality. But more importantly, why is BAR minimizing the use of any kind of bombing & weaponry against Syrian civilians? It isn’t irrelevant that BAR just published a laudatory article about Filipino president Rodrigo Duterte for standing up to the US, making no reference to Durterte’s death squads against drug users or his involvement in the US re-militarization of the Philippines. This division among antiwar activists will either be resolved democratically at a national conference including all, not just leading figures, or it will continue to paralyze opposition to all US wars. The only principled demand is opposition to US, Russian, & all foreign military intervention into Syria, Iraq, & elsewhere, in the air & on the ground. Since when do antiwar activists without the authority to do so declare some bombing progressive & some reactionary!? That demand must include Syria end the bombing of civilians, under any guise. This photo is Homs, Syria. Is this anyones’s vision of freedom? 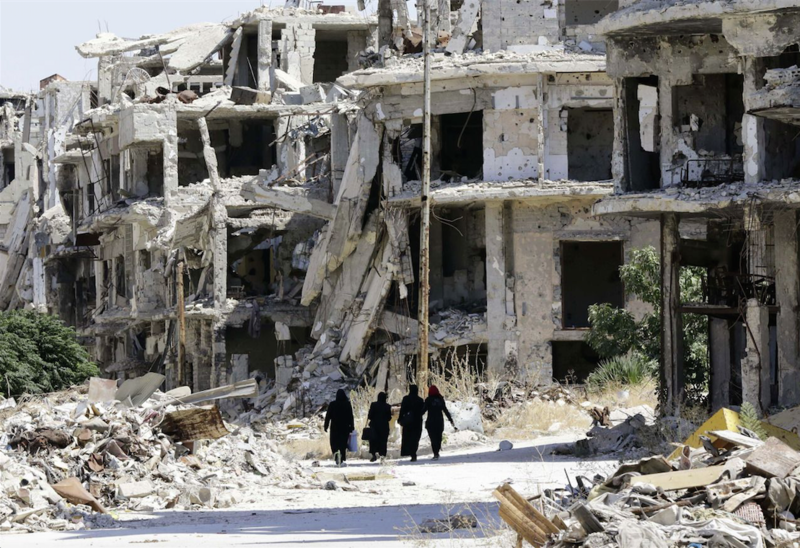 Not that of Syrians who have either been bombed to death or have fled as refugees. The US-Russian cease fire in Syria that was supposed to start last Monday ends tonight, long before the bombing ever ceased. What’s the damn thing really all about?